Seattle-based Ivi opened its doors on September 13, 2010. It charges (or charged, depending on the outcome of the fight) viewers $4.99 per month after a 30-day free trial to stream live TV via a Windows, Mac or Linux download. 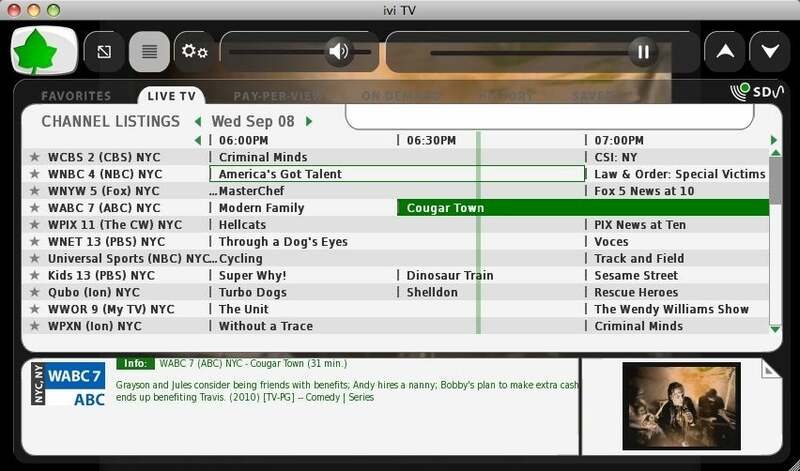 Ivi was immediately hailed as the "future of television" and a reason for cutting cords with cable companies. But after receiving several cease-and-desist letters from major broadcasters, Ivi predicted a lawsuit. So on September 20, Ivi filed a preemptive lawsuit against the broadcasters, asking a judge to declare Ivi's actions as legal. Ivi founder Todd Weaver cited Section 111 of the U.S. Copyright Act, which details circumstances under which rebroadcasting television programming is not, in fact, infringement. If the appropriate rebroadcasting fees are paid, which Weaver claims they were, Ivi is legit. "Ivi is not another Pirate Bay or Napster trying to gain from others' works. Rather, Ivi wishes to work with content owners in helping them to realize new revenue streams and reach more viewers from around the globe," Weaver said. Despite Weaver's "I'm on your side" posturing, the National Association of Broadcasters wasn't placated and said in a statement: "It is blatantly illegal to steal broadcasters' copyrighted works and signals." To this, Weaver said, "Broadcasters fought against cable companies, then joined them. Broadcasters then fought against satellite companies, then joined them. Now it is our turn. History has a habit of repeating itself -- and it is unfortunate they cannot learn from that and realize we strongly support broadcasters and their program suppliers helping them monetize, increase their eyeballs, and ultimately get paid." This legal back-and-forth is expected to last a very long time. But let's back up a minute and examine Weaver's claim of history repeating itself. Live TV on the Internet hasn't had much success. In 2000, Canadian-based iCraveTV.com was shut down for the same violations Ivi is accused of. iCraveTV claimed it was acting in accordance with Canadian rebroadcasting laws, but rather than engage in a drawn-out legal battle, it chose to fold. One year later, RecordTV.com -- an "online VCR site" (whatever a VCR is) -- was also crushed for copyright infringement. Though RecordTV is a little different than Ivi, in that it granted the ability to download programs to one's hard drive, it stood behind rebroadcasting rights. Still: shuttered. So if Weaver is right and history does in fact repeat itself, Ivi may be facing grim times ahead.